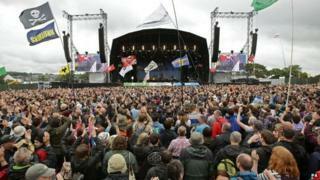 Foreign music fans visiting the UK for gigs and festivals boosted the economy by £3.1bn in 2014, a report says. The report by industry body UK Music said foreign visitors spent an average of £751 and helped sustain almost 40,000 full time jobs. Across the UK 9.5 million people travelled to music events. Culture Secretary John Whittingdale said the news was "fantastic" but not surprising as "British music is legendary around the world". The industry and continues to go from strength to strength, he added, with UK artists now accounting for one in seven albums sold worldwide. "Festivals like Glastonbury hold an iconic status on the world music scene and are one of the reasons why international tourism is booming in the UK, drawing in streams of visitors to all parts of the country. "We know our UK creative industries contribute an astonishing £76.9bn to the UK economy but this report confirms they are truly world-class and a powerful advert for the UK." Festivals like T in the Park, Celtic Connections and the Wickerman festival helped to attract 721,000 music tourists to Scotland in 2014. Researchers also found a 39% rise in the number of overseas tourists travelling to the UK for music over the last four years. UK Music is made up of industry groups representing musicians, songwriters, record labels and studio producers among others.